Peel, wash, cube & cook the plantain pieces in a little water along with some salt & turmeric powder till it is soft to touch but not mushy. Add the boiled cubes of the plantain to this along with the chilli powder & cook for 5-7 min on medium heat keeping the pan covered.Remove the lid and stir. 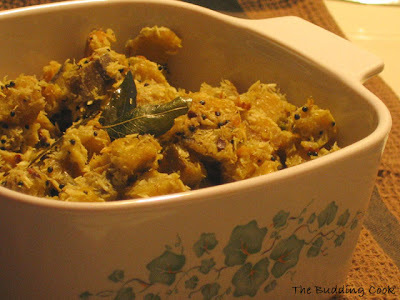 Serve hot as a side-dish for rice with some sambhar! I have Panjabi at FH,it's Wednesday! I will post the recipe someday soon!